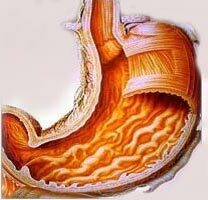 Gastritis is a common disease which is linked to an inflammation and excessive amounts of acid produced in the stomach. This ailment if accompanied by pains and discomfort in stomach, burnings sensation, heartburn and other symptoms. Gastritis can be caused by physical factors like taking certain medications, bacterial infections, bad easting habits or alcohol abuse, and psychological habits, like prolonged stresses and nervous tension, etc. There is a variety of home remedies for gastritis, which include many herbs and plants, as well as natural products like honey and others. The most effective suggestions embrace using coconut water, potato juice, chamomile and ginger root tea with honey and lemon juice. Chewing a small piece of fennel or ginger root, as well as one-two pieces of cloves can bring a quick relief of the symptoms of gastritis, especially in the morning. Also, it is recommended to add to the daily diet the foods rich in natural fiber, like cabbage, fresh fruit, etc. Besides, such natural remedies as licorice, spinach, carrots and artichokes can effectively calm down pains and discomfort associated with gastritis. Other herbal remedies for gastritis include peppermint, marshmallow, papaya seeds, Carom seeds, cardamon, fennel, basil and others which can be used for preparing special homemade remedies for gastritis. Some specialists can recommend adding to the daily diet such products as white vinegar and garlic, but those remedies should be taken with a great extent of carefulness because they can be harmful to many patients who have serious digestion problems, like ulcers. Celery is one of the most valuable natural foods, which is one of the best known natural deposits of various nutrients and vitamins. It is rich in vitamins A, C, K and E, essential oils, carotene, microelements and other nutrients. Health benefits of celery root are numerous and in order to enjoy them one needs to simply add this vegetable to the daily diet. 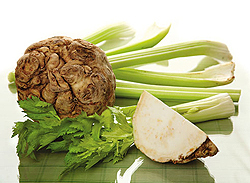 Celery root has excellent calming, analgesic, antiseptic, anti allergic and other therapeutic properties. This natural product is recommended to those patients, who suffer from various problems with digestive system, including ulcers, gastritis, indigestion, a lack of appetite and so on. Health benefits of celery root also embrace the powers of this natural remedy to improve the function of our liver and bladder, calm down arthritis pains and get rid of swellings, improve our vision and stimulate metabolism. For many years celery root has been known as a natural aphrodisiac which can improve our stamina and even assist in treating frigidity. Regular consumption of celery is linked to improved memory and mental abilities, lowered risks of inflammations and ailments connected with the function of urinary system, etc. Celery can fasten the processes of fat burning and this way assist in speeding up weight loss. Those who want to enjoy health benefits of celery root should use fresh and 100% organic root which has maximum amounts of useful chemical compounds and therapeutic properties. Our body is a very complicated and balanced system, but every day we consume great amounts of foods which are digested in our body. But sometimes our body gets tired and exhausted, and can’t manage with recycling all harmful toxins and substances. As a result, they get stored in the body and cause various diseases. That is why it is very important to perform cleansing procedures on a regular basis. Body cleansing using homemade remedies is the safest and the most effective choice for those who need to restore natural balance and natural toxin removal. The first rule is to follow a light and healthy diet plan, eat more fresh fruit and vegetables, at the same time to avoid consuming heavy foods like too sweet or fried foods. It is necessary to regularly eat fish and beans, strictly avoid overeating and drink sufficient amounts of water. For effective cleansing, it is recommended to use a special diet plan involving cereal products. In particular, it can be effective eating boiled rice, French barley, oatmeal and other types of cereal. These products are low in calories, rich in fiber and can absorb harmful chemical substances. Such diet plan should be supported with great amounts of water, as well as eating fresh veggies and fruit. Another recommended way is using known natural diuretics. For example, eating melons and watermelons can assist in toxin elimination and maintaining a proper liquid balance in the body. If you made up your mind to use these foods for body cleansing, it is effective to support your diet with regular seances of aromatherapy and warm baths. Using various berries, carrots, lettuce and other greens, as well as other natural foods also can assist blood, liver, kidney and bladder cleansing. Summer is a season when we have opportunity to take care about our health properly: eat light and very healthy meals, do lots of outdoor activities, spend time outside playing games, swimming, hiking and so on. It is very important to follow a healthy nutrition plan in summer as a variety of fresh fruit and vegetables is available at the market. Therefore, summer is just the time to put off weight, cleanse our body from harmful toxins and stimulate metabolism. The world’s leading nutritionists suggest eating not less than 5 types of fruit and veggeis every day. 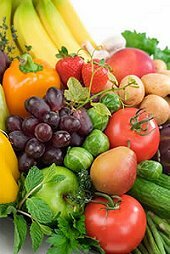 Those can be any types of your favorite greens, sweet or juicy fruit like strawberries, cherries, apricot, pineapple, berries and so on, or crunchy veggies like bell peppers, cabbage, broccoli, cucumbers, carrots and so on. Therefore, preparing light summer salads can be the best way to follow this valuable recommendation. You can add a little of your favorite nuts (like cashews, hazelnuts, walnuts, etc.) and dress your salad with a little of lemon juice and high quality vegetable oil. Do not forget about the greens – probably, the best summer foods. They have very high nutritional value and are packed with useful natural minerals and microelements. For example, spinach is rich in iron and has very low calories, and lettuce can be an excellent source of vitamin C. Add parsley, lettuce, rocket salad, spinach, and other your favorite greens to your salad, and benefit from a high nutritional content and therapeutic powers of these gifts of our Mother Nature. In addition, you can prepare the same kind of salads using not only vegetables, but fruit as well. Or, you can try to prepare a fruit smoothie: fresh fruit blended with ice and possible some type of sweetener. A smoothie can be a wonderful idea for hot summer days, or even as a nutritious breakfast. At the same time, do not forget about adding to your summer diet the foods rich in natural proteins, such as eggs, soy beans, chicken and turkey. Finally, try to eat fish products at least two-three times a week. Summer is a very good time to start changing your life, getting rid of bad habits and developing new good habits. In this season we have an abundance of healthy meals, sunlight, time for outdoor exercises and so on. Check out the following tips on how to change your life for better with better health care. 1. Watch comedy movies and read funny stories in internet on a regular basis. Those will help you to relieve tension, stimulate your blood flow and even enjoy slight analgesic powers attributed to humor. Do you know that there are special medical establishments which offer laughter therapy? 2. Go in for yoga. A yoga program will help you learn more about healthy lifestyle and help you relax very effectively. You can choose other type of physical activities, just do not overload yourself with exercising in this hot season. 3. Go in for lots of outdoor activities. Jogging, swimming, cycling, hiking, walking around are just perfect outdoor activities, and summertime is perfect time for them. 4. Do not overload yourself with work and have sufficient amounts of sleep every day. Remember that a lack of sleep affects our immune system to a great extent, therefore seep not less than 7-8 hours a day. 5. Remember that healthy nutrition is one of the key health care factors. In winter we tent to eat heavy and warm foods, but in summer it is just great time for eating fresh veggies and fruit, drinking freshly squeezed juices, smoothies, cereal, beans, nuts and other healthy foods. Never skip breakfasts and do not eat 3-4 hours before going to bed. 6. Use aromatherapy as an important part of your persona health care plan. Aromatherapy has amazing effects not only on our psychological condition, but it can also help us lower the risks of some common diseases, relax our nervous system and so on. 7. Use massage therapy. This is a wonderful therapy in the context of your personal health care plan, which can stimulate blood flow, improve metabolism and tone your muscles. 8. Women can allow several visits to a cosmetologist. This is recommended not for physical, but more for psychological effects. If by some reason you can’t do so, find some time to take care about your beauty at home using home made remedies. 9. Do not avoid being exposed to sunlight before 10 a.m. and after 4 p.m. It is important for a proper health care as sunlight helps our body produce many important natural substances, like Vitamin D and others, which are vital for our good health. 10. Try to learn to enjoy everything you do. Keep in mind that negative emotions affect our health badly, especially in conjunction with the effects of stresses, such as anxiety, nervous tension and so on. Hi! Welcome to pmep.info ! !